Flavor Text: He ran and ran, but there was no escape. 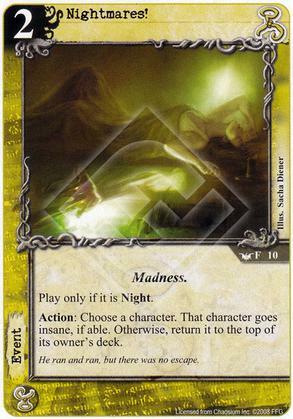 Any insanity card for Hastur that lets you do something even against terror icons or willpower is very powerful indeed. Clogging up draw and draining a domain for them to replay the card is still decent enough for the event. Balanced though as you have to make it night first. Being able to remove a character from play, even temporarily, is good. Hastur are desperate for cards to sidestep terror icons and willpower and this fits in nicely. Being able to work on ancient ones is the icing on the cake. It could also be used to save one of your characters in a pinch. This is exactly the effect that Hastur needs. Unfortunately, it's hobbled by the casting restriction. If this cost 3 instead of 2 and removed the night-only clause, it would be a solid include. As it is, you have to build around it somewhat, which makes it less appealing of an option, despite a strong effect.